The LMFDB is a new web resource developed by a large team of mathematicians around the world. The www.lmfdb.org describes LMFDB as the database of L-functions, modular forms, and related objects. L-functions are like the DNA of mathematics. The article at ECN by the American Institute of Mathematics is the best introduction to LMFDB. I highly recommend it. This article uses metaphors like “periodic table of mathematics”, “grand unified theory of mathematics”, experimental mathematics involving massive computations, “landscape of landscapes”. The Langlands Programme, formulated by Robert Langlands in the 1960s and since much developed and refined, is a web of interrelated theory and conjectures concerning many objects in number theory, their interconnections, and connections to other fields. At the heart of the Langlands Programme is the concept of an L-function. The most famous L-function is the Riemann zeta-function, and as well as being ubiquitous in number theory itself, L-functions have applications in mathematical physics and cryptography. Two of the seven Clay Mathematics Million Dollar Millennium Problems, the Riemann Hypothesis and the Birch and Swinnerton-Dyer Conjecture, deal with their properties. 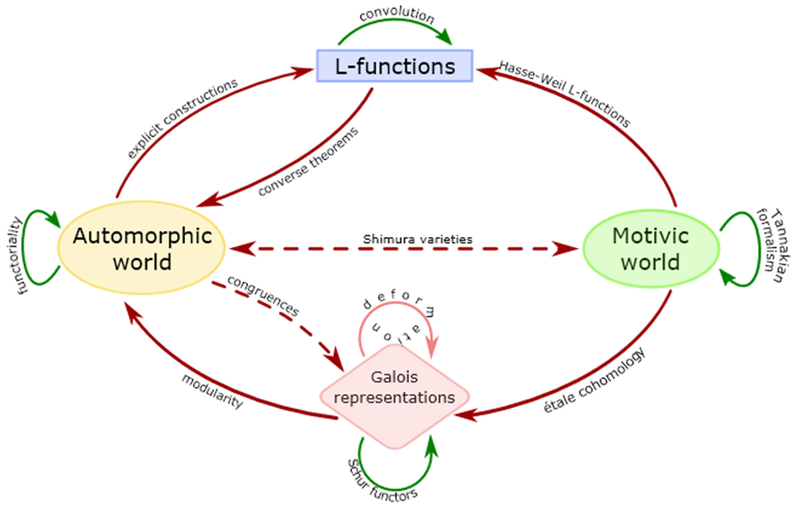 Many different mathematical objects are connected in various ways to L-functions, but the study of those objects is highly specialized, and most mathematicians have only a vague idea of the objects outside their specialty and how everything is related. Helping mathematicians to understand these connections was the motivation for the L-functions and Modular Forms Database (LMFDB) project. Its mission is to chart the landscape of L-functions and modular forms in a systematic, comprehensive and concrete fashion. This involves developing their theory, creating and improving algorithms for computing and classifying them, and hence discovering new properties of these functions, and testing fundamental conjectures. This entry was posted in mathematics and tagged computational number theory, L-functions, modular forms. Bookmark the permalink.